Laura Fisher, a native of Coos Bay and a founding member of the ETPA, brings strong financial acumen and business skills to our board. Laura is a Certified Public Accountant and has helped the ETPA in the past by reviewing our accounts and financial controls to help us ensure that we are managing your donations properly. Laura is a Partner in Hough, MacAdam, Wartnik, Fisher & Gorman LLC and is responsible for their auditing and financial review business. Laura has served on the Oregon Board of Accountancy Continuing Professional Education Committee and is a past Treasurer for the Coos Bay Downtown Association and also for the Coos Bay Area Zonta Club. She is a member of the American Institute of Certified Public Accountants as well as the Oregon Society of Certified Public Accountants. She is also an associate member of the Government Finance Officers Association and will serve as president of the South Coast Chapter of the Oregon Association of Certified Public Accountants during 2014-15. 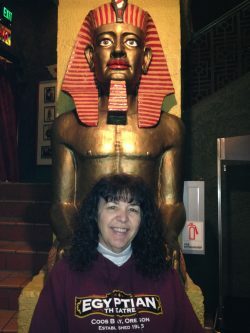 Laura has many fond memories of our Egyptian Theatre. Some of her best childhood memories are of taking two Williams Bread wrappers to use to get in free for the Saturday matinee at the Egyptian! Laura has a strong interest in preserving and operating the Egyptian as a vibrant and active community entertainment center.